To meet the E-rate competitive bidding requirements and submit a timely FY2017 funding application, applicants were required to submit their E-rate Form 470 by April 13, 2017. The Form 470 notifies potential vendors that schools and libraries are in the market to purchase goods and service with E-rate discounts. For the third year in a row, the number of applicants posting Form 470s has declined. The overall count was down 13% from last year. 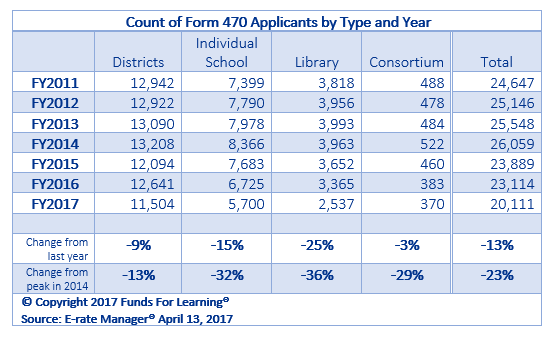 The two groups that have seen the biggest change are individual schools and small libraries, although participation is down among all applicant types. The reduced number of applicants likely stems from (1) the phase down of support for telephone service (previously the most requested service) and (2) USAC’s difficult-to-use online portal (EPC). 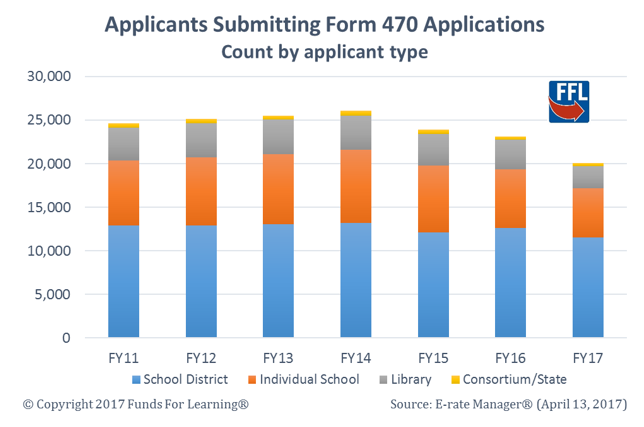 It remains to be seen whether the reduction in Form 470 applicants will translate to lower demand during the Form 471 filing window, but the initial indications are that the number of funding requests is likely to be lower in 2017.